Draft: 2012, Texas Rangers, 2nd rd. 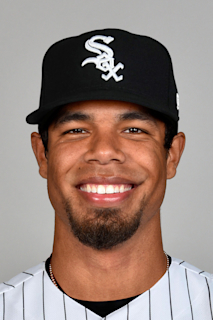 Billy Nicholas Williams… Engaged to Brianna Goodfriend… 2012 graduate of Galveston Ball High School (TX)… Batted .537 with 13 HR, 30 RBI as a junior and .422 with 25 SB as a senior… Was rated by Baseball America as the 100th-best position prospect and the 31st at the high school level going into the 2012 First-Year Player Draft… Had committed to Texas A&M University before signing with TEX… Hobbies: Top Golf, going to the movies and spending time outdoors…Signed by: Jay Heafner. Made his 1st Opening Day roster...Among all MLB pinch-hitters, finished 1st in go-ahead RBI (4), T-1st in game-winning RBI (3), T-2nd in HR (3), 3rd in TB (20), T-4th in XBH (4) and T-7th in hits (10) & RBI (8)...Made 102 starts: 89 in RF, 12 in LF and 1 as DH...The Phillies went 19-5 in games in which he collected multiple hits (9-1 at home)...Was T-1st on the club with 5 outfield assists...Ranked 2nd on the team in game-winning RBI (10)... Hit .357 (10-28), 2B, 3 HR, 8 RBI, 2 BB, HBP as a pinch-hitter...Collected his first pinch RBI, 3/30 at ATL... Slugged his first career pinch HR on 4/9 vs CIN (Kevin Quackenbush)... Homered in consecutive games, 5/29-30, for the first time in his career... Was the first Phillie with 3 pinch HR by the end of May in a season since 2009 (Matt Stairs - 3)...Recorded his first career multi-HR game, 7/26 at CIN; also tied his career high with 4 hits...Became the first player in the majors with 3 pinch-hit home runs to give his team a lead in a season since 2004 (LAD's Olmedo Saenz, 3 and COL's Mark Sweeney, 3)... His 4 go-ahead RBI as a pinch-hitter were the most by a Phillie since 1984 (Len Matuszek - 5). Among NL rookies, ranked 3rd in AVG (.288), 4th in OBP (.338), T-4th in triples (4) & OF assists (4), T-5th in multi-hit games (25), 6th in RBI (55), 7th in SLG % (.473), 8th in total bases (148), 9th in hits (90) and T-9th in runs (45)... Began the season with Lehigh Valley (AAA)... Slugged 2 HR, 5/28 vs Louisville, his third consecutive game with a HR (4 HR)... Had 7 HR over 8 games, 5/20-28... Drove in 15 runs over a 5-game span, 5/24-28... Named International League Player of the Week, 5/22-28 (.435, 5 HR, 15 RBI)... Recalled on 6/30... At the time of his recall, had the following International League rankings: 3rd in total bases (144) & games (78), 6th in HR (15) & SLG % (.511), 9th in RBI (44), T-9th in AB (282) and 10th in hits (79) & OPS (.839)... Prior to his call-up, had reached base safely in 14 consecutive games (.308, 16-52, 6 2B, 2 HR, 4 RBI, 8 BB)... Made his ML debut, 6/30 at NYM, in a start in LF and collected his 1st ML hit (singled off Jacob deGrom)... Had a 4-game hitting streak to begin his ML career, the first Phillie to do so since Jimmy Rollins in 2000 (6 G)... Slugged his first ML home run and recorded his first RBI, 7/9 vs SD (Trevor Cahill)... Became the first Phillie with 18 RBI in his first 20 games since Leo Norris in 1936 (22)... Collected 2 triples, 7/19 at MIA, to become the first Phillies rookie to accomplish the feat since Jimmy Rollins, 6/24/01 at FLA... Had a career-best 12-game hitting streak, 9/2-14 (.415 AVG, 22-53)... Clubbed his 1st ML grand slam, 7/16 at MIL (Tyler Webb)... Had 33 hits in September, which were the most by a Phillies rookie in September since 2003 (Marlon Byrd, 36 hits)... Hit an inside-the-park HR on the final day of the season, 10/1 vs NYM (Rafael Montero)... In September/October, ranked 2nd in the NL in RBI (25) and was T-3rd in hits (35)... With the bases loaded, went 5-for-9 (.556), 2B, 2 3B, HR, 17 RBI, 1.444 SLG %... 7 of his 12 HR either tied a game or gave the Phillies a lead... His 39 hits through his first 35 career games were most by a Phillie since Jimmy Rollins had 40 in his first 35 career games... Made 79 ML starts: 56 in RF, 12 in CF, 10 in LF and 1 as DH... After making his ML debut on 6/30, among all NL rookies, ranked 1st in AVG (.288) & RBI (52), T-1st in times on base (116), 2nd in hits (90), OBP (.338), SLG % (.473), total bases (148) & runs (45), T-2nd in triples (4) & XBH (29) and T-3rd in doubles (14). Began the season with Frisco (AA)... Played for Team USA in the All-Star Futures Game, 7/12 at CIN's Great American Ball Park (1-2, RBI, R)... Traded to the Phillies on 7/31 and assigned to Reading (AA)... Went 4-for-5, 5 R, 2B, 2 HR, 3 RBI, BB in his 2nd game for Reading, 8/5 at Trenton... Was on the 7-day DL, 8/28-9/6 (concussion)... Hit 3 HR in 8 Eastern League playoff games... Reduced his SO rate from 28.8% in 2014 to 18.8% in 2015... Batted .330 with a .914 OPS vs RHP as opposed to a .210 AVG and .602 OPS vs LHP... Following the season, was named the 2nd-best prospect in the Phillies minor league system by Baseball America... Participated in Florida Instructional League. Began the season with Myrtle Beach (A)... Named both a midseason and postseason Carolina League All-Star... Ranked 2nd in the CL in OPS (.837), 5th in AVG (.292) and T-6th in HR (13)... Was on the 7-day DL, 6/6-23 (left hamstring strain)... Promoted to Frisco on 8/15... Played for Surprise in the Arizona Fall League... Selected to the AFL Rising Stars Game... Following the season, was named the 4th-best prospect in TEX's minor league system and the 84th overall by MLB.com. Spent the season with Hickory (A)... Named a South Atlantic League postseason All-Star... Led the SAL in triples (12) and fi nished 3rd in SLG % (.543), 7th in AVG (.293) and T-10th in HR (17)... Batted .303 with 7 HR and 17 RBI over his first 18 games... Was on the 7-day DL twice: 4/25-5/23 (dislocated left shoulder) and 8/1-7 (stomach infl ammation). Spent his 1st pro season with the Arizona League Rangers (R)... Posted a professional-best .375 OBP... Finished 4th in the AZL in triples (6). June 30, 2017 Philadelphia Phillies recalled RF Nick Williams from Lehigh Valley IronPigs. March 17, 2017 Philadelphia Phillies optioned LF Nick Williams to Lehigh Valley IronPigs. November 18, 2016 Philadelphia Phillies selected the contract of Nick Williams from Lehigh Valley IronPigs. April 2, 2016 LF Nick Williams assigned to Lehigh Valley IronPigs from Reading Fightin Phils. January 6, 2016 Philadelphia Phillies invited non-roster LF Nick Williams to spring training. September 7, 2015 Reading Fightin Phils activated OF Nick Williams from the 7-day disabled list. August 4, 2015 OF Nick Williams assigned to Reading Fightin Phils. July 31, 2015 Philadelphia Phillies traded LHP Cole Hamels, LHP Jake Diekman and cash to Texas Rangers for Matt Harrison, C Jorge Alfaro, RHP Jerad Eickhoff, OF Nick Williams, RHP Alec Asher and RHP Jake Thompson. July 15, 2015 Frisco RoughRiders activated LF Nick Williams from the temporarily inactive list. July 11, 2015 Frisco RoughRiders placed LF Nick Williams on the temporarily inactive list. March 8, 2015 OF Nick Williams assigned to Texas Rangers. August 15, 2014 LF Nick Williams assigned to Frisco RoughRiders from Myrtle Beach Pelicans. June 24, 2014 Myrtle Beach Pelicans activated LF Nick Williams from the 7-day disabled list. June 20, 2014 Myrtle Beach Pelicans sent OF Nick Williams on a rehab assignment to AZL Rangers. June 6, 2014 Myrtle Beach Pelicans placed OF Nick Williams on the 7-day disabled list. April 1, 2014 OF Nick Williams assigned to Myrtle Beach Pelicans from Hickory Crawdads. March 15, 2014 OF Nick Williams assigned to Texas Rangers. August 8, 2013 Hickory Crawdads activated OF Nick Williams from the 7-day disabled list. August 3, 2013 Hickory Crawdads placed LF Nick Williams on the 7-day disabled list retroactive to August 1, 2013. May 24, 2013 Hickory Crawdads activated LF Nick Williams from the 7-day disabled list. April 26, 2013 Hickory Crawdads placed LF Nick Williams on the 7-day disabled list. April 3, 2013 LF Nick Williams assigned to Hickory Crawdads from AZL Rangers. March 9, 2013 LF Nick Williams assigned to Texas Rangers. June 20, 2012 Nick Williams assigned to AZL Rangers from Texas Rangers. June 12, 2012 Texas Rangers signed OF Nick Williams.